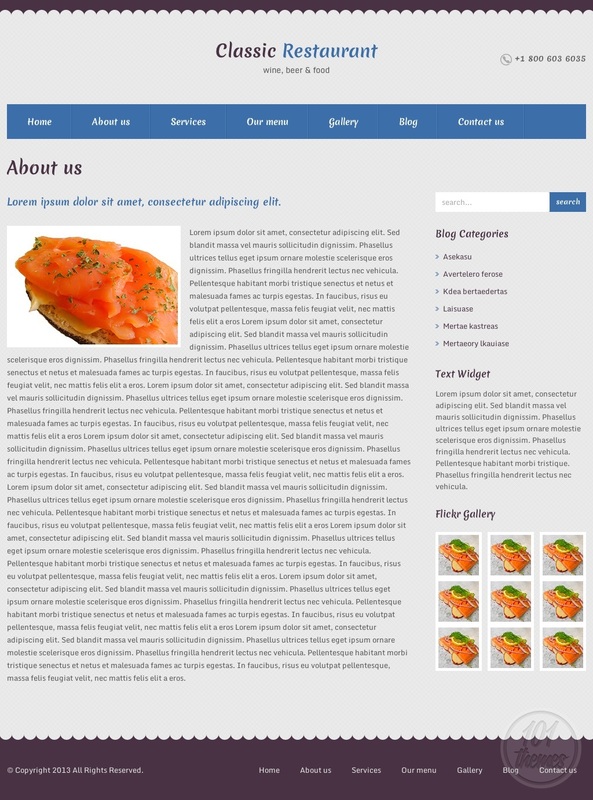 Restaurant is a HTML restaurant template that can be used for all kinds of restaurant niches. 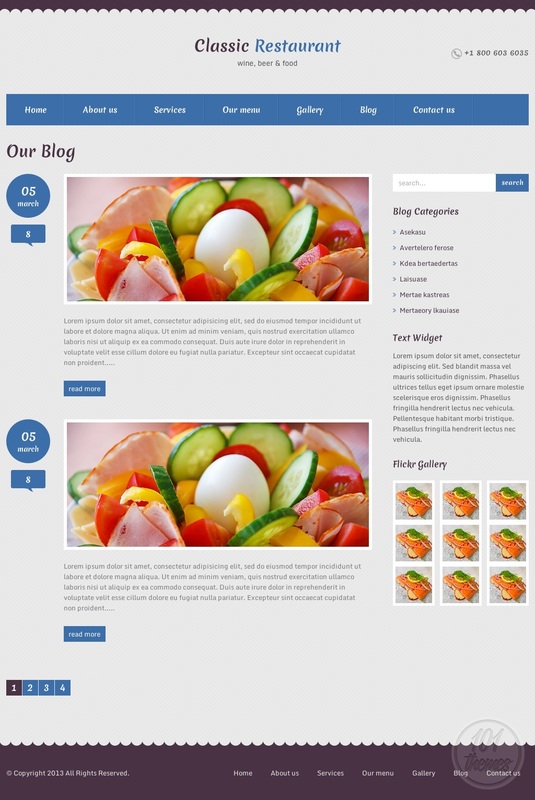 The template is featured at ThemeForest and Rurirapi developed it. 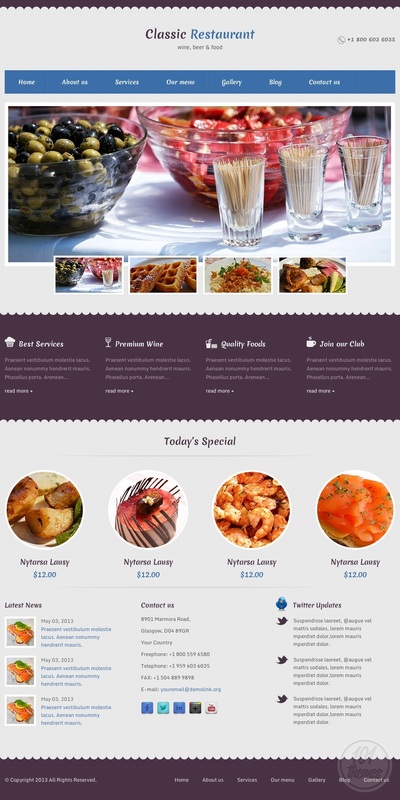 Restaurant looks very pretty and it is very easy to customize as well. Nice shades of violet were added as details and great contrast to the bright content space colors. The homepage is enhanced by a wide slider where you can place the most remarkable photos of your delicious specialties and grab everyone’s attention with it the moment they enter your website. You can feature various posts under this slider and this way you will make sure the most important posts are highlighted for everyone to check out. The next section on the homepage is reserved for featuring your today’s special offers, and they will be presented with resized images and prices. After clicking the image, your visitors will be redirected to a page where they can read all about the delight they got interested in. Your contact details and social buttons can be presented at the bottom of the homepage, and this gives you many sharing possibilities. Besides these social buttons, a Twitter update widget is included so you can have your latest tweets displayed on your homepage too. The latest news will be shown right next to the contact info. The menu looks great and you can have a wine menu and a lunch menu. 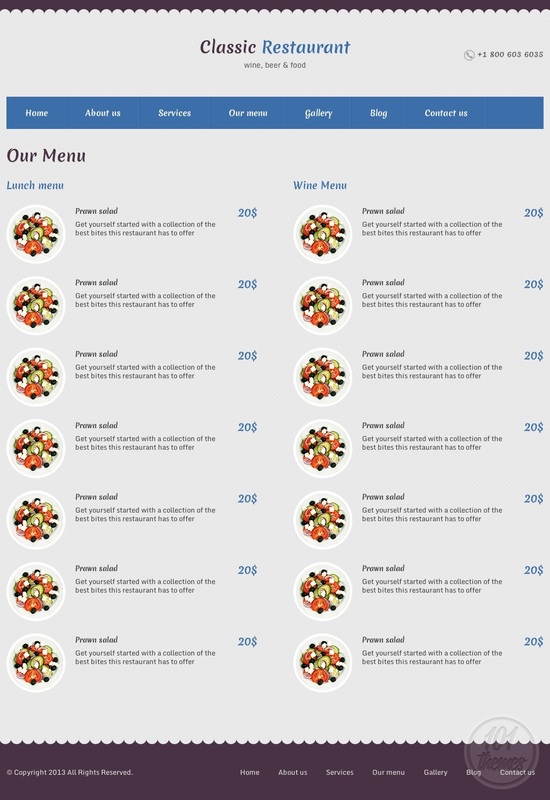 Each menu item will have its own page where you can add photos and write detailed descriptions on every one of them. 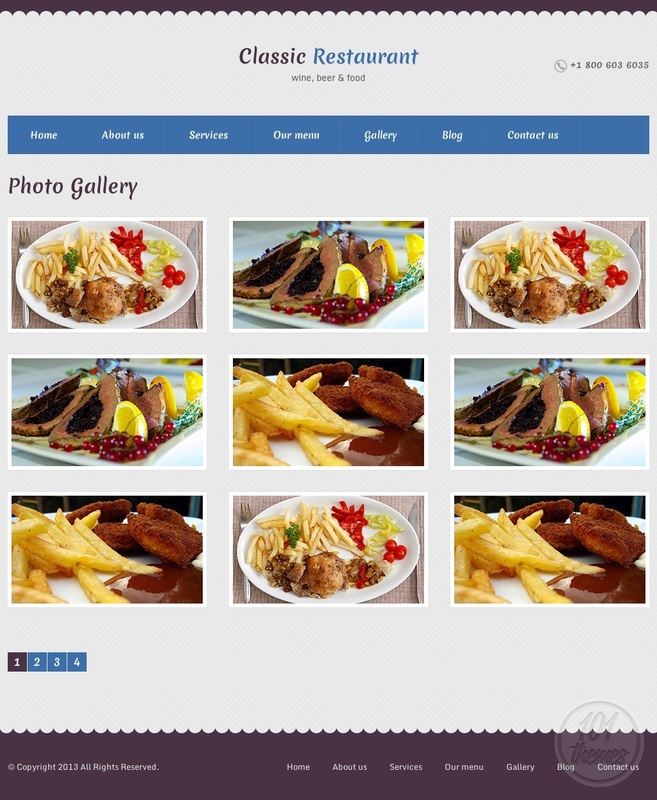 There is a gallery section included for you to post many photos of your nice restaurant, or photos of your delights. You can also have your Flickr gallery appear here thanks to an integrated Flickr widget. The contact section includes Google Maps integration and a contact form so everyone can message you easily and quickly. 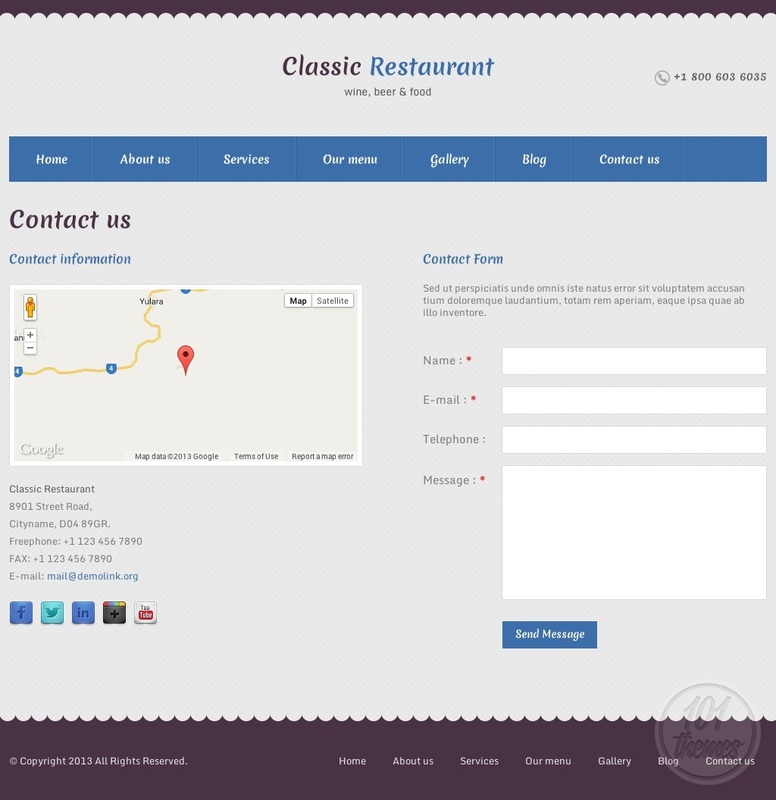 Restaurant can be used as a HTML cafe template, or for any other restaurant niche you might think of, as it is very adjustable and it fits the needs of any great restaurant.